Owner and CEO of GreenPower, Rob Forrest, has long been an avid cyclist and supporter of mountain biking since the late 80’s. Having competed in road cycling at a younger age, he made the swap to mountain biking thinking it was a safer sport, little did he know. Whilst never competing in mountain biking, he was keen to support those who do race and those who volunteer their time to run the Scottish Downhill Association (S.D.A.) race series. And so the GreenPower SDA Academy was conceived with the aim to develop up and coming riders from each of the age categories competing in the races. The twelve riders selected each year have all showed hard work, commitment and dedication to their racing and training, but needed a little extra coaching and guiding to achieve their full potential. This is a three year academy, however a different set of riders is chosen every year, helping coach and develop thirty six riders in total. Riders are selected evenly from the different categories supported by SDA and include both male and female riders. Rauridh (middle) stops the group to discuss line choices and drops. This is where Dirt School and their highly experience coaches come in. Being able to work with coaches such as World Cup racer Ruaridh Cunningham (UCI Junior DH World Champion in 2007) and Andy Barlow to name but a few, has proved to be a great successes. Working with Dirt School a plan was set up to have three training days staggered throughout the winter. These training days would cover everything from the complete basics, such as body position, to the advanced techniques such as conquering the most slippery and slimy roots. By spreading the sessions out over the ‘off season’ (winter) it would allow the riders time to go home and practice all that they had learned before their next session. It can be easier said than done. Here the coaches demonstrate the correct technique as the Academy riders look on. Now into its second year, the Academy has proved to be a great success with riders achieving personal goals, podium results and several riders competing in the British downhill series. 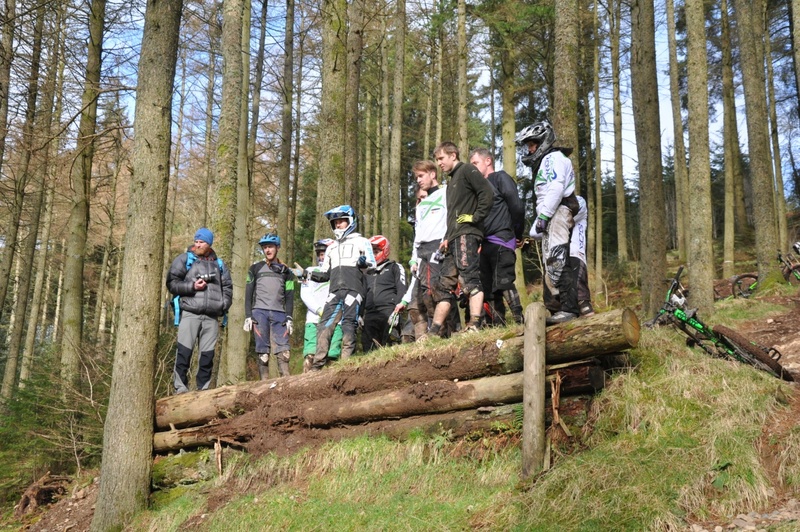 Here we have photos taken from the last training session at Ae forest, just a couple of weeks before the first race of the year. 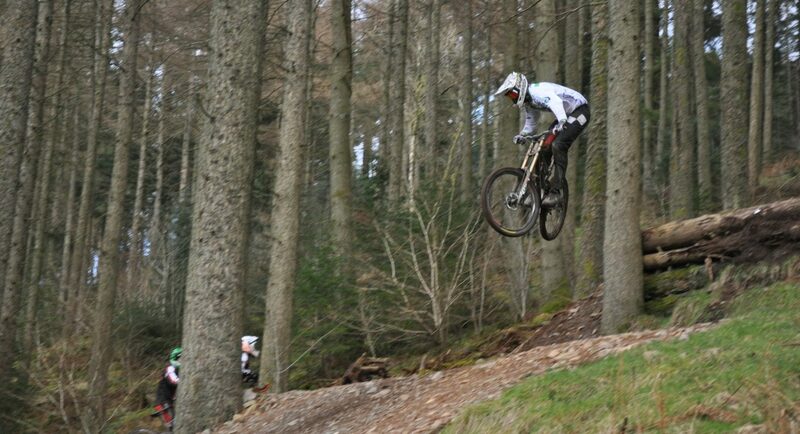 Academy rider Ruairidh Fraser showing some style over the infamous Forest of Ae step down. GreenPower’s funding will also leave behind a legacy that helps to secure the long term future of the SDA series as the funding has already contribute towards the cost of purchasing essential infrastructure such as the new race timing system, the new P.A. system, a new trailer and generators. The SDA website provides further information and explains how to enter their fantastic race series and Dirt School provides first class training and coaching.